Most crustaceans that people call “shrimp” are decapods, but this is a syncarid crustacean. 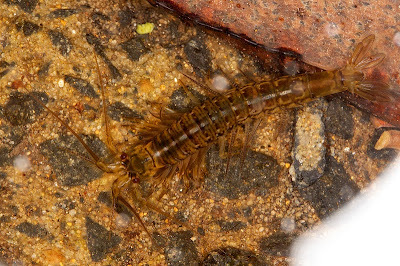 Its body is jointed all the way along its length, and its paired legs look much more like something that you see on early fossil crustaceans. Yet there are neurons in this beast that are recognizably similar to those in its far distantly related relatives, the shrimp that you and I know. Picture by zosterops on Flickr; used under a Creative Commons license.